Call it Arizona’s Shock Doctrine. And the children are the shock troops. 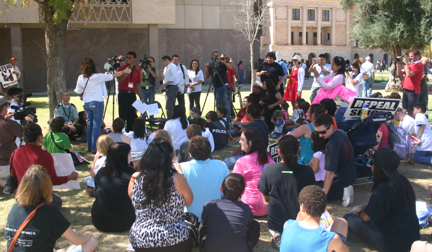 On the eve of the Arizona state legislature’s historic vote today on a blockbuster array of radical new immigration bills, including a controversial legislative challenge to a US Supreme Court ruling for K-12 education access for undocumented students and 14th amendment birth rights, children from Tucson to Flagstaff held a symbolic sit-in on the Capitol lawn with a reminder that no one would suffer more from the draconian bills than state’s youngest. In a stunning defeat to Senate President Russell Pearce, every immigration bill was voted down by his own senate today, even though Pearce defiantly declared immigration was a state issue, not a federal one. And for Pearce, he may have lost the battle, but the war over immigration in Arizona will continue to flourish. Despite the fact that Arizona has the lowest crime rates in 40 years, Gov. Jan Brewer has joined Pearce in turning immigration troubles into Arizona’s own shock doctrine vehicle for their radical agenda. Pearce learned a lesson today, though. On the heels of an unforgiving year of outrageous state rebellion, children in Arizona have had to create their own book of humanity–if only to defend their state’s diverse heritage and basic human rights. As part of the Repeal Coalition campaign in Arizona, a volunteer grassroots organization that is calling for the end to all hateful, anti-immigrant legislation and for the Repeal of SB1070 and other anti-immigrant laws, the children and youth opened a stunning new chapter in the on-going saga of an Arizona state legislature gone wild. And not just undocumented children. Already ranked at the bottom of funding per pupil nationwide, Arizona’s legislators singled out education for the deepest cuts in their budget yesterday, including a 26 percent reduction in university funding and a 7 percent reduction in K-12. – Senate Bill 1222 would require public-housing operators to evict anyone who allows an illegal immigrant to live with them, as well as require proof of legal status to receive any public benefits. – SB 1012 would allow the Arizona Department of Public Safety to conduct fingerprint-background checks on only individuals who can prove that they are U.S. citizens or legally eligible to work in the state. The state-issued fingerprint-clearance cards are required for a variety of jobs and work permits. – Senate Concurrent Resolution 1035 would ask voters to change the state Constitution to prohibit any state official or agency from using a language other than English for official communications. Individuals could ask that communications be conducted in a second language, but the state doesn’t have to adhere to the request. 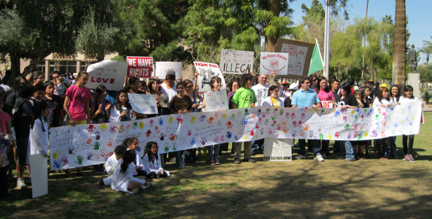 The full Senate is also expected to vote in the coming days or weeks on broader immigration-related measures, including SB 1611, which makes several changes to immigration law, including preventing children not born in the U.S. from attending school, prohibiting illegal immigrants from driving or buying a car, and denying illegal immigrants the ability to obtain a marriage license in Arizona. Other pending bills include SB 1405, which would require hospitals to check the legal status of a patient if he or she was unable to show proof of health insurance, and SB 1308 and SB 1309 – the “birthright citizenship” measures. “These bills will be back again next year,” one state senator warned. The final showdown in Arizona has yet to come.